This book did bring home to me how much has changed in the technology of photography, even if the principles remain the same. I now have trainees who have never heard of 35 mm slides and are aston- ished to see my box-loads of redundant images, with only a small fraction digitised. Older readers will remember Ektachrome, with X-rays appearing as either green or blue, depending on the bad choice of film, and slide projectors that either burnt your slides, once jammed, or cast them on the floor when the projectionist inverted the carousel. I recall a trip to Malaysia, when my carry-on baggage weighed more than my suitcase, something to do with the 2000 slides therein. Correct photography of X-rays required Kodak Rapid Process Copy Film and a 14-second exposure (seriously), for images now obtained by pressing on ‘save’. Close-up photography, with a dedicated macro lens and ring flash, cost me over £800, this more than 20 years ago, on a camera recently donated to the local charity shop, in perfect working order and worth about £35 online now. Digital photography has made it all so easy, so I was curious to see what this book would add. It serves as an atlas of standardised photography, and largely concentrates on poses and views, in order ‘to serve as a clinical record rather than teaching …’. The authors do also emphasise the value beyond cosmetic surgery, stressing ‘quality images … increasingly important in today’s practice environment’, which as subsequent text makes perfectly clear is to provide a defence to litigation. Chapter 1 covers the basics of photography, largely unchanged over the decades. The ‘exposure triangle’ is still that trade-off of ISO (International Standards Organization) setting, shutter speed and aperture width, to allow light to fall onto a light-sensitive source and produce a focused image with some depth of field. The subsequent review of camera bodies and especially lens characteristics was particularly interesting. Endoscopic photography remains challenging and the message is clear: you simply have to spend! Chapter 3, on studio photographic techniques, is, by definition, for the professional. Macro photography, for subjects an inch or two in diameter, I did look forward to. This is now astronomically expensive. Replacing my 35 mm Yashica Dental Eye II, with a similar ring flash and macro lens as illustrated here, would be quite an investment. I did wonder if they now come with a preview light, because one big snag was trying to focus within a bodily cavity, in almost pitch darkness, prior to triggering the flash. Image processing has, of course, transformed photography, and I would love to try ‘focus stacking’ as described here. It had not dawned on me, but this huge advantage must be sacrificed, when the purpose is purely a clinical record. Editing is not allowed. Storage, confidentiality and the consent process is a contemporary nightmare, when compared to the file cabinets of 35 mm slides many of us recall carelessly accumulating over previous decades. The smartphone is suggested as of value as ‘better than nothing’ for unexpected intra-operative events, but I have been impressed by the quality of images my patients can sometimes produce, to illustrate their lesions now resolved. 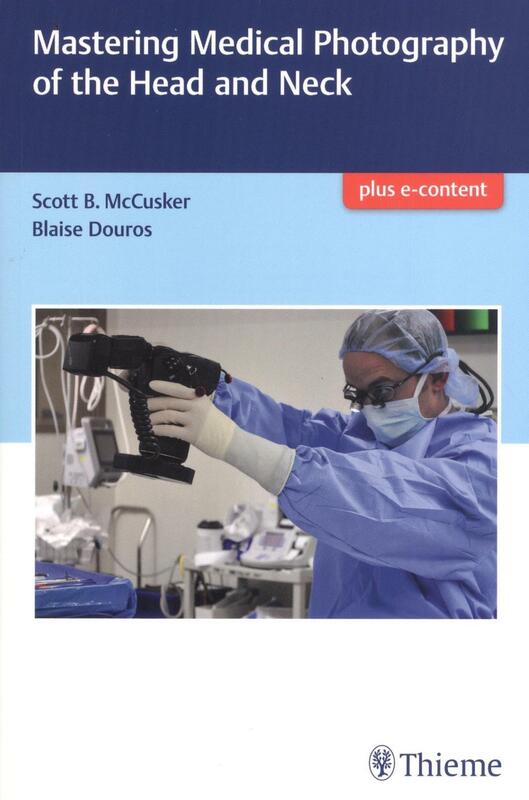 The chapter on intra-operative photography is brief, again as the emphasis is on personal clinical documentation, rather than education. Otology is not covered, not unreasonably if we consider the book title. Curiously, the images of the oral cavity and oropharynx are by far the least convincing in the book, in total contrast to those from paranasal sinus surgery. There is very useful online content of images and videos, to supplement the text. Overall, the emphasis is on facioplastics, with standardised poses and techniques, all for accurate clinical records rather than presentations and lectures. It does provide a good review of the basics for beginners, but one doubts whether such individuals will be tackling medical photography. Recent and expected future advances I found of greatest interest, even though my priority now is more how to safely dispose of nearly 4000 35 mm transparencies.